A new collection engages directly with how political science can achieve wider relevance as a discipline. Matt Wood finds The Relevance of Political Science a must read for any scholar interested in the impact debate and he welcomes a return to the more social constructivist ideas of impact through teaching and learning. But there is a risk this relevance debate descends into a Buzzfeed world of hints and tips. More attention could be spent justifying to society why the theoretical and conceptual work political scientists already do is intimately valuable in any democratic society. Relevance of Political Science. Edited by Gerry Stoker, B. Guy Peters and Jon Pierre. Palgrave Macmillan. 2015. What more is there to be said in the debate on ‘relevance’? To the extent that there ever could be a ‘debate’, it now surely remains settled, with the breathtakingly swift institutionalisation of impact case studies into the REF agenda, the plethora of blogs and buzzfeed style hints and tips for the impact savvy social scientist, and the growth of completely un-self-consciously parodying terms like ‘deep impact’. What more then, is there to say? 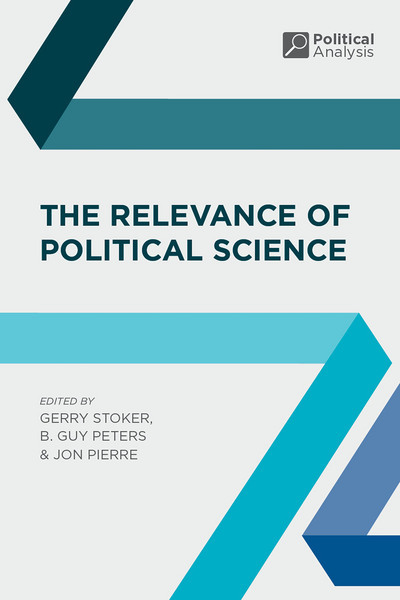 According to Stoker, Peters and Pierre in their new edited collection The Relevance of Political Science, quite a lot, actually. For them, “the key agenda is how best to understand the obstacles that need to be resolved in achieving relevance and the potential for relevance that could thereby be realised”. So the ‘how’ question is now central: we all want to be relevant, and indeed to accuse political scientists of ‘irrelevance’ might be viewed either as an eyebrow-raising political move, or a deeply patronising misunderstanding. But the key is how to make that relevance less a rhetorical trope and more of an empirical reality. The Relevance of Political Science helps to highlight the range of answers to the ‘how?’ question, particularly the relevance of teaching, but could go further in stressing the importance of conceptual and theoretical reflection about politics. Importantly, The Relevance of Political Science starts not from the argument (often pushed rather too frequently) that political scientists are intellectual hermits who need to be cajoled into believing in an abstract relevance ‘crusade’. Colin Hay in his contribution wittily terms this the ‘Glasnost’ movement, echoing the American Perestroikans of the early 2000s. Instead, the book begins with the meat of the problem: How can political scientists, in all their theoretical, conceptual and empirical diversity, achieve the perception that they are ‘relevant’? The answer is a strongly pluralistic discipline, with a diversity of approaches to relevance, and in particular how ‘post-positivist’ political science finds relevance within the classroom. This route to relevance through teaching is perhaps the most traditional concept of relevance. Indeed, if we view impact this way, then arguably the ‘alternative’ approaches to political science – the constructivists, post structuralists, critical theorists – those who often protest against the ‘impact agenda’, in fact hold the upper hand here. They provide an excitingly radical and different take on important societal topics with the power to excite and engage students when taught correctly. To date, this argument has been unaddressed by advocates of the impact agenda, and this book does a huge service by taking it seriously. Impact should be viewed in its broadest possible format, not because it is somehow kind and inclusive to these ‘marginal’ approaches (something of a patronising argument) but because the mainstream impact agenda has treated the whole idea of impact somewhat wrongheadedly. Returning to this more fundamental idea of impact through teaching and learning is an important correction to the current research output focused agenda. What really makes political science relevant? But in reflecting on the book I still found myself wanting to know more – wanting to know why the activities I do as a political scientist genuinely matter to society. Of course, the methods we use to be perceived relevant are important, but there is a risk we simply descend into a buzzfeed world of hints and tips, of producing various how to guides for ‘being relevant’ rather than quite fundamentally advocating for why our discipline as a theoretical, conceptual and methodological enterprise is relevant. In my own work, I am interested in conceptual formulation about understanding and defining concepts in a way that makes them clearer and enables academic work to proceed (I hope) with rigour and clarity. In this book I did not find much justification for why this aspect of political science would be important. The emphasis seemed to be that none of what we do has much meaning if we cannot be influential in public debates, drive a change in public policy, or provoke and challenge our students. The inherent value, the reason why studying politics systematically or scientifically ought to matter seemed to get lost. The Relevance of Political Science stresses the importance of ‘real world problems’ driving research, but I found this potentially muddling. Which forms of political science research do not address ‘problems’ in the ‘real world’? Or rather, are there any researchers out there who in principle could not somehow justify their research by resort to an important ‘problem’, if pushed? Curiously, the book does not give many examples of ‘irrelevant’ researchers not guided by ‘problems’, leading me to think that if there are any then this is probably more to do with their being slightly offended by the relevance question rather than any inability to answer it. The real challenge to my mind is to justify why there really needs to be a political science approach to the problems we address. Put simply – why does society actually need theoretically, conceptually and methodologically rigorous knowledge about politics rather than simply timely and helpful evidence about what works, which other providers apart from political scientists readily provide? This might seem a daunting question, but it is quite easily answered. As Gerring argues, ‘concepts are critical to the functioning and evolution of social science’. Clarity of thought, intellectual willingness to define, delimit and defend one’s understanding of a word, a term or a theory, is a good thing in a democratic society that wants to solve complex problems. Managing the humanitarian crisis in the Mediterranean at the moment requires, for example, a reflective understanding of what it means to be a stateless asylum seeker. Tackling the challenges of climate change requires a nuanced understanding of ‘the climate’ and how it reacts to human interventions. Such nuances can be brought out by presenting our empirical findings accessibly, but also by encouraging reflection on concepts in public forums. In a recent appearance at a local public debate about devolution my first and seemingly most well received intervention was to ask “what do we mean by devolution anyway?” As a concept, it is amorphous, and is used to often justify very different outcomes and policies. By simply asking what do we actually mean by the concept of devolution I was able to get the audience into a more reflective mood, away from the to and fro of particular government policies, or the when, how and if of the government’s northern powerhouses devolution policy. This, to me, is at least partially the role of the ‘relevant’ academic. We have the unique position of being able to reflect critically on how society understands concepts, theories and empirical data relevant to democratic choices and actions. If we do not offer this reflective capacity by trying to improve how concepts are understood, then we run the risk of merely being in competition with so many other retailers, government bodies and NGOs who want to brand and market concepts and images purely to make money or implement policy. So, The Relevance of Political Science is a must read for any scholar interested in the disciplinary debate on relevance. It is a crucial intervention to move the relevance debate from the ‘why’ question to the ‘how’ question of relevance. Its most enlightening chapters highlight how different parts of the discipline can gain relevance, or can justify what relevance to the ‘real world’ they already have. In doing so, however, this collection also distracts from the essentially political project of justifying to society at large why the work we already do has value – because it is intimately valuable in any democratic society that values a deep and nuanced understanding of the problems society faces. As Hay argues in his contribution, “relevance itself may not be the issue – since most of what we do has the potential to be deemed relevant or to become relevant at some latter point, if only we were willing to make the case for it”. Making the case is the crucial point, however. All of political science is profoundly critical to society, and we maximise its visibility by presenting research findings in accessible ways to a range of relevant audiences. But the theoretical developments made and the conceptual advances attained cannot be given a backseat against the ‘headline findings’ and ‘so what?’ questions given greatest prominence in this book. They deserve a prominent place in any agenda for advocating the relevance of the discipline because they give our work the distinctiveness that other organisations and individuals lack. Matt Wood is Deputy Director of the Sir Bernard Crick Centre for the Public Understanding of Politics and ESRC Future Research Leaders Fellow 2015-18. From September 2015 he will be a Lecturer in Politics at the University of Sheffield.